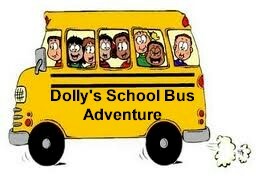 DIY - Dolly's School Bus Adventure fundraiser! Head Start children and wrapped them in see-through cellophane tied with a large bow and put them in the display case closest to the cafeteria. We cut out paper school buses from bright yellow paper and sold them for $1 each. As they were purchased, the buyers would put their names (or their children or grandchildren’s names) on them.